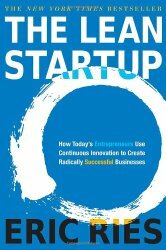 My Rating: 9.6/10The Lean Startup – In his hugely popular book, Eric Ries basically expands on Steve Blank‘s “Customer Development Model“, a formula for building successful and sustainable products and businesses. The main idea of the book is about shortening the product development cycle by way of validated learning. It encourages building MVP (minimum viable product) version of the idea and then adding small iterations and improvements to the product. Each new iteration (i.e feature) has to be tested against the customers. So that, you are absolutely sure that the features you are adding to your products are actually useful to your customers.